The men of Knights of Columbus Santa Maria Council 1733 are no strangers to kindness. The council, based in Canton, helped make St. Casimir Catholic School’s new playground a reality by donating funds for the project. 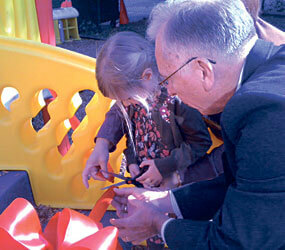 The new playground was dedicated Oct. 7 following a school Mass. With members of Council 1733 in attendance at the dedication, students sang songs of appreciation and anticipation of using the new playground. The 98-year-old council has a long relationship with the Canton school, awarding annual $500 scholarships to its middle-school students. The scholarships follow the students as long as they are enrolled at St. Casimir and maintain their grades. Heffner responded that St. Casimir had a busy preschool program and that a new playground would be a major help. Heffner researched the cost and went back to Tyszkiewicz with specifics. Council 1733 approved the funds and began the process of making it happen. In addition to the council, an anonymous donor contributed to the playground effort. The council’s relationship with St. Casimir is close in others ways, as it gave Conventual Franciscan Father Dennis Grumsey, pastor, a chalice with the Knights of Columbus seal and the council’s name on it. The council has also made contributions to Mother Seton Academy, a middle school in Baltimore, and Archbishop Borders School in Highlandtown. Tyszkiewicz said the council is made up of men from around the Baltimore area who have formed strong bonds. For more information on Council 1733, call 410-342-1733. It’s been a rewarding few weeks for St. Casimir School, meanwhile, as Baltimore City councilman James Kraft honored students Sept. 26 at a city council meeting for their efforts to help clean the Chesapeake Bay. Students drafted legislation to make proper disposal of water more accessible, designate officers to patrol littering, create a community clean-up organization, utilize volunteers to clean the water on a scheduled basis, build blockades to prevent trash in open waters and improve the city’s drainage system.